Has Merkel Just “Blinked” and Saved the Euro Project? A picture tells a thousand words. The chart below shows just how grave the situation in Spain is. Europe is in crisis and the euro is in danger of falling apart. Things have become so serious that President Obama has intervened and has asked British Prime Minister David Cameron to travel to Berlin today and put an ultimatum to Chancellor of Germany Angela Merkel: “act before it is too late”. 3. “Derek Scally of the Irish Times reports that British Prime Minister David Cameron is expected to raise the issue with chancellor Angela Merkel when he travels to Berlin today. 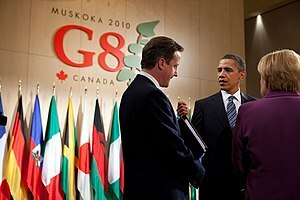 Mr. Cameron is expected to pass on to the German leader the central message of a phone call he had yesterday with US president Barack Obama on “an immediate plan for the solution of the crisis and restoration of market trust”. National lines could make an orderly breakup of the euro possible in a few years time and, if it were not for the social and political dynamics, one could imagine a common market without a common currency. But the trends are clearly non-linear and an earlier breakup is bound to be disorderly. It would almost certainly lead to a collapse of the Schengen Treaty, the common market, and the European Union itself. ( It should be remembered that there is an exit mechanism for the European Union but not for the euro.) Unenforceable claims and unsettled grievances would leave Europe worse off than it was at the outset when the project of a united Europe was conceived. Today it looks like Angela Merkel has heeded Mr. Soros’ advice and gone for the “least worst” option. Should she manage to convince her political backers to allow future bank bailouts without sovereign interference Spain will probably agree to stay within the euro. Such a mechanism would also suit Italy should the need arise. The only problem now is that the fund required to solve this problem will need to be in the magnitude of 2 – 3 trillion euros. This is why I think President Obama and David Cameron have decided to get directly involved. The game now is only open to high rollers and the stakes could not be higher. We certainly are living through historic days. Author’s Note: TARGET2 is the real-time gross settlement (RTGS) system owned and operated by the Eurosystem. TARGET stands for Trans-European Automated Real-time Gross settlement Express Transfer system. TARGET2 is the second generation of TARGET. I welcome this excellent summary of the current situation in Europe and for the first time I whole heartily agree with sums you have come up with another 2.5 to 3 trillion Euros) that will be required by Germany to save the euro and yes you are right it’s going to have to be Germany that has to put its hand into its pockets or else walk away from the whole mess! Well done and keep up the great work ! Internet Reformation Is EU Reality? A defiant Angela Merkel is doing no more than defending the interests of her own electorate … As the leader of a democratic state, what else should she be expected to do? Would Mr Cameron, who is busily assuring us that he will always put the needs of this country first, be chivvied into throwing over the interests of his own citizens for the sake of another national population that has come to grief largely as a consequence of its own misjudgments? Last week, he called for the “pooling [of] fiscal sovereignty” among the eurozone countries. Would he be willing to give up his Government’s right to determine its own tax and spending policy?